Goalpost reviews and genuine comments about actual goalposts used over time not just “one-liners” about service and quick delivery from paid review companies. We only publish genuine customer football Goalpost reviews sent directly to us. Goalpost reviews – Garden goal birthday gift – If Carlsberg made football goals…….I don’t normally write reviews but felt given the level of personal service and the quality of the football goal I received, it was imperative that I did. I wanted a football goal for my son, aged 6. I did the usual research, others dad’s and the internet, as well as the high street stores and supermarkets. All sources came back with mixed reviews, faulty nets, goals that either collapsed, rusted or needed a degree in quantum physics to understand the instructions! I then found ITSA GOAL. I rang the number on the website and spoke to John Wilson, he could not have been more helpful, he listened and listened to my ever expanding needs, a personal service as it should be, no hard sell, just friendly advice on what to look for in a goal. In time honoured fashion I left it late to order for my son’s birthday so I rang the company and spoke to Jon Paul Wilson who was fantastic (personal service runs in the family) as although in the middle of stocktaking and closed, he organised and sent out the football goal which arrived the next day! The football goal is perfect, a late night construction and I am no DIY expert! Hey presto the chance to relive my youth, oh and of course a present for my son and heir! Study, solid and withstanding the great British weather! Before you ask, no I am not related or work for ITSA GOAL posts I am just a dad who wanted a football goal in the garden for his son. An excellent product, superb company, as I said in the beginning if Carlsberg made football goals……….. this would be the place. Goalpost reviews – Stage 1. Goalpost reviews – Stage 2. 6th Birthday Football Party. Ten kids having the game of their lives!!!! game. This has really assisted my sons development massively. Goalpost reviews – Stage 3. Goal” that isn”t in my opinion too expensive. The quality of the product is incredible. skills, and create some fantastic training drills with his three goal set up. service, and now the goal is bigger I may even score!!!!!!!! Thank you for everything Georgina you and the team have been amazing. very quickly. Very impressed with everything. Goalpost reviews – I’m very very pleased with your “fantastic “service and the quality of your 12 x 6′ ITSA GOAL Post. Goalpost reviews – I have to say your company ITSA Goal should be very proud of the service you provide to your customers. You do everything you say you’re going to do and go out of your way to make your customers like me very happy. I would say it is an absolute pleasure dealing with your company. It’s all about the backup and after sales service that a lot of people don’t appreciate. You are top of the class at this. It means everything. Best Regards. Purchased 8′ x 4′ football nets for my son. Love’s them! Good quality, better than Samba Goals. Goalpost reviews – We have attached a link to the Match of The Day of the Day footage that was taken at the tournament. The site looks great and you can see the football goals in all their glory: http://www.bbc.co.uk/sport/football/36005747 .The speed that you put them up was great and the overall look of the goals was fabulous. The Volunteers at the end of the day were also impressed by how quickly they came down. So all in all, happy customer’s. I will not hesitate to use “it’s a Goal” in the future. Goalpost reviews – Forest Green Rovers Football Club – We ordered four 12′ x 6′ aluminum lightweight goals for our annual Youth and Business Tournaments. The member of staff who processed our order was very helpful and honest about the additional accessories that we may or may not require. The goals were delivered quickly and well packaged. Once built, the goals are very lightweight and easy to move but at the same time strong and durable. As a football club, we would be more than happy to recommend ITSA GOAL posts to our clients. Goalpost reviews – Thank you so much for your assistance this morning. it is so rare to receive such excellent customer service! I have recommended you on my FB page, are you on twitter as I will tweet too! Thank you again. Goalpost reviews – Just received my Mini Soccer Goal today,got to say how pleased I am with it. My son has had a few goals in his time and not one of them comes close to this one. The uPVC is as strong as can be, it fixes together nice and tight and the net is top quality. I nearly got a samba goal …I’m so glad I did not. If anyone is thinking of getting a football goal I would totally recommend this product. The customer service is brilliant and it turned up on time. A great big thank you to Georgina. Goalpost reviews – Inflatable goals – If we do have any left kicking around anywhere, sling them in the skip awful product; Lucky to get them to stay up for half an hour, never mind all day. So for U8’s, U9’s and U10’s rigid plastic goals that can be transported to the tournament are best and most cost-effective. All our coaches & managers at Henfield U9’s feel that ITSA GOAL posts are by far the best quality & comparative value for money (not expensive). They take only an instant to set-up if purchased & utilized in a similar form to the U9’s compared to anything else on the market such as Samba Goals. I am not connected to the Company that makes them; but having visited their factory in Sheffield and having previously done bundles of research & comparisons before purchasing, I can vouch for endorsing what the U9’s have. So on that basis, I would recommend the high Impact PVC ITSA GOAL posts. The reason that the U9’s goals go up/down in two minutes is because we purchased one-piece crossbar and back-bar and keep the end-triangle side frames erected with net this one; PVC Mini Soccer Goal the ‘best’ option (operationally) is the one-piece bars, ready-erected triangles ; but this means the goals need to be stored on-site or at home and transported to matches in a suitable vehicle but worth the effort in time saved on the day. If you cannot transport the one section goal posts to the site then exactly the same goal, but in a bag which most clubs are familiar with is available. Obviously, this takes longer to set-up/take down by comparison. ITSA GOAL makes much stronger and better bags that unlike other goal bags that need two people one person can carry with lateral and horizontal support straps, buckles and a zip to ensure parts are not lost. The reason I ask whether the Club wants to just look at the tournament in the most cost-effective way or if there is genuine intent to invest in goals that they have a need for the future; is that ITSA GOAL also make a budget garden goals version called FOOTIEGOALS (possibly plenty strong enough for the one weekend tournament. Goalpost reviews – I just wanted to email and tell you how fantastic the ITSA GOAL post has been that we purchased from soccertackle.com. We purchased the goal two years ago for my son’s birthday and it has been amazing compared to the flimsy goals we have purchased before from another commonly known brand of a plastic goal. Our football goal is stored on hooks outside all year and we must say how impressed we have been that the goal has not deteriorated from its new condition, even through rain, snow, and sun! the net is as new, still a brilliant white! My sons are now twelve and fourteen, both have a strong kick on them and the goal post has responded well. Previous football goals we have used cannot withstand a strong whack with a football, often falling apart, but the goal post we purchased from you has been rock solid… Having the single piece crossbar is a winner too, as the goal remains in a goal shape, unlike our previous plastic football goals which bowed to form a very none-goal shape! Thanks for creating and providing such a great football product. Goalpost reviews – I’m delighted with this product! I first became a customer of ITSA GOAL back in the early 1990’s when my dad bought us a 12’x6′ uPVC goal for the garden. It lasted us years and got a huge amount of usage. Over 20 years later, I now run my own grassroots youth football club in Harrow. Having initially bought sets of Samba goals (with a 3-section crossbar), I was disappointed to find that they quickly started to dip significantly in the middle – not a great look. When the time came to purchase additional goalposts, I was delighted to see that ITSA GOAL was still going strong. I chose the high impact Mini soccer goals with two section crossbar and am pleased to report that they still look great with no visible signs of dipping. Throughout my recent transactions with ITSA GOAL the customer service has been excellent. I am always on the lookout for the best products for my club and so I am very pleased to be able to continue my long-standing relationship with this company. I hope to see more of their goals in the Harrow Youth League this season! Goalpost reviews – Let me start by saying how pleased i am that you and your company are finally getting the recognition you rightly deserve with your excellent products by the FA finally adding your company to the list of approved suppliers and I hope that acknowledgement has been accompanied by a corresponding surge in business that has helped ease some of the financial burdens I know you have been under. I have to report that the Mini Soccer goals we purchased from you and the 9v9 goals we purchased from you are still in an as new condition and have performed excellently and far exceeded my expectations (based on years of Samba Goal use). At the end of last season I was planning on packing up my involvement at the club and stepping down as chairman, I had been slowly reducing my football involvement outside of the club as well, but then I agreed to stay one more season coaching the new U7’s which has actually led to coaching the U15’s and U18’s as well, and an award from the county F A and a trip to Buckingham Palace, have all helped me to realise I cannot leave the club until my original goal of providing football from 6-60 is realised. To that end the club will be taking up an additional facility this year, and we will be looking to purchase full-size adult football goals (24′ x 8′ goal posts), my instant feeling is that they should not be permanent, to give us the maximum options of moving pitches and not having to install sockets, and naturally I thought of you and your company. Based on Your experience John, what do you think will be the best product form you and can you give me a price for ( two sets) to include all nets & fixings. Goalpost reviews – Hi, just an update, my son loves his new football nets. He said it’s the best football goals he has ever had. Excellent service, and quality product. Thank you very much. Goalpost reviews – Re; your recent post via Horsham & District Youth Football League pertaining to ITSA GOAL posts, which I have been passed on by our Club Secretary. Frankly, I swear by their products and would be hard-pressed to purchase any other football goals from elsewhere, either in the PVC or Aluminium. In my own opinion, a no-brainer – The items I have purchased for Henfield U8’s/U9’s whom I Coach are of excellent quality and better than anything else I could find on the market in terms of robustness and cost. I personally purchased our Mini Soccer goals as one section crossbars to allow us to just take the end triangles-off (as opposed to buying a Samba Goal with a bag full of bits to set-up each Saturday or training session). Admittedly I have an Estate car and they hang out of the back, but the benefits of only taking literally less than one minute to erect by this option are untold on a cold muddy morning! Your U9’s have seen/are familiar with our goals, as we took them over to our 3G facility only recently to play our match whilst the poor weather was hampering grass fixtures. You are always welcome to pop down the A24 to have a closer look or give me a call on the numbers below. The company also offer a sale or return and un-matched two-year guarantee on plastic goals. The second good reason for purchasing ITSA GOAL posts – An entirely UK small family Company operating out of a sports ground under the shadows of Sheffield Steelworks, and their MD John is mad-fanatical on safety and kids football which is reflected in his products. I visited John at his factory whilst working in the area as part of our own market research. I am not in any way affiliated with the company ; but if you should give John a call (which I would recommend, he is very helpful and does not do the hard-sell thing), please mention Andy at Henfield U9’s, as we do keep in touch and he would appreciate knowing that someone recommends his products. Goalpost reviews – Many thanks for the FOOTIE GOALS. They are extremely robust and easy to assemble. I Have had a lot of interest from family and friends over the weekend so you may have a couple more orders very soon. Goalpost reviews – R & T Tours purchased eight sets of aluminum portable goals in bags for small-sided 9v9 games from Soccertackle this year. We used all the sets at our football tournaments all over the country and we found the goals to be absolutely perfect for our needs. Portable, light, easy to assemble and strong. We also use your full-size adult portable aluminum goals and we would recommend your goals to anyone. Goalpost reviews -Very pleased with 16’x7′ uPVC 9v9 Goal posts with single section aluminium crossbar – top quality product. We are also looking for some full-size goals so we will be in touch thanks. We have now purchased four sets of uPVC ITSA goal posts from soccertackle.com, they are so easy to put up and take down on match days, and are without doubt excellent quality, All our teams recommend them to every junior football club, they really do the job well. The work in the Sports department at Cambridge University required good quality 5-a-side goals that could withstand impact, yet could be easily stored. Previously I purchased a set of goals from Argos which ended up being thrown away after the first tournament as they just shattered. I would thoroughly recommend the uPVC goals supplied by this company, the quality and customer service is far superior to the larger brand name online retailers. The goals are fantastic! we are excited about putting them to good use + The target goals we have just ordered will be very useful in training. Will send you some pictures of our duff inflatable” I-goals”. We were extremely impressed with the new Mini Soccer Goals in the first competitive outing, and we soon mastered from boot of the car to erection in under 3 minutes each goal (and that was just me and my 10-year-old daughter assisting). The opposition was similarly impressed and I noticed that their Coaches were giving them an interested and thorough inspection after the game. (they must still have time-consuming Samba Goals) Now I know a bit more regarding whats what with the Football goals and have seen how the Mini Soccer size can fit in my car without dismantling for the short distance to our home pitch from my house. (again, that’s the beauty of the goalposts they are so flexible, they cover all the bases) I will not hesitate in buying more; the beauty is, that they are such a flexible product, lending towards being easily played around with to suit a particular user’s application. On the internet, Peter Shilton was still promoting/endorsing inflatable I goals (which was one of the things that gave us initial confidence in buying the inflatable goal product (which endured about four matches before the first of a great many embarrassing failures with both the goals themselves and the pumps).Thanks again for both sized sets of uPVC goals that we have recently bought – Very pleased with the purchase. I find your goals far superior to Samba goals and the shape is just fantastic. Lots of clubs have enquired about these goals as Samba Goals just don’t look the same and don’t feel of the same quality. The arrow-shaped hooks certainly make the goals stand out from the rest as it looks like an aluminum goal from a distance. As a premium football coaching product, we are very pleased to have such high-quality goals at our ground. We approached ITSA GOAL for two 3/4 new Junior Football club Goalposts and nets for our first season at eleven-a-side. The two John’s were brilliant working within our rather tight budget. They delivered right on time under some very difficult constraints and our football goals arrived bang on time to prepare for the season. These goals are absolutely fantastic, we have now had them in and out of our porta-cabin and in the ground, more than one hundred times and the simplicity, weight, and safety are second to none. The aluminum means that they are so easy to carry and when they are up they look just the business. A true customer friendly company and more importantly real value for money. The Mini Soccer Arena looks very impressive. I know Sheffield is quite a distance away but once all the work has been completed and the site is neat and tidy again it would be good if John could come down to Allhallows again and see just how good the arena looks and what an asset it has become to our youth club. ITSA GOALS part of the project has gone very well and it has been a pleasure to work with your team.I must say that the other youth club committee members and myself and are very happy with the end result. The goal is fantastic, easy to put up and take down and already taking a battering. Every school should have sets of football goals like this. Sasha Bogunovic, Warner Bros. Los Angeles, California. ” Just to say thank you for the football goals. I am a very happy customer. The goals arrived within 48 hours and they look fantastic. They are very strong and thanks to the net attachments look far better than a Samba goal. ” I would just like to say how pleased we are with the lockable fold-in Mini-Soccer goals we recently purchased. We have fastened the netting permanently onto to frame and now they can be easily stored and carried with the netting fixed to the goal. Once carried to the pitch the goalposts can be erected and secured to the ground within 60 seconds which is absolutely fantastic. As well as being easy to erect they are also the best and most professional looking goals in the league. Every team that comes to play us comments on the football goals. We have tried several types of goals over the years. Plastic, fully erected aluminum, solid D-side bracket types and these are by far the best we have ever had. Well done for a fantastic, innovative football goal design”. 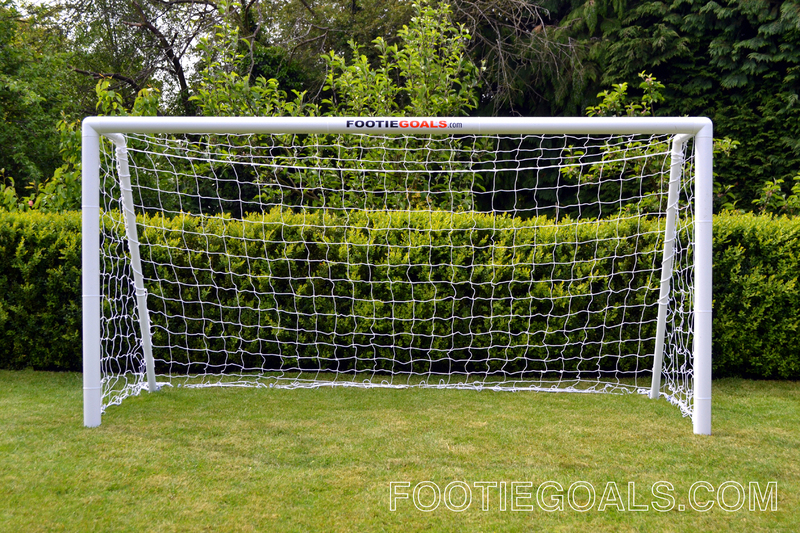 Goalpost reviews -” In August of 1998, I purchased a 12 x 6 uPVC football Goal for my son Jack’s 9th birthday. It has stood in my garden all year round ever since. The amount of use has been staggering by a keen footballer and all his friends. Jack played in a youth team from the age of 10 to 18 and with football parties, cup finals and internationals played in our garden, it has taken a battering. I am pleased to say that it has only been in need of a structural repair once. You were able to replace the broken part within a few days. I have easily been able to replace the net by mail order and have just worn out the Third net in 12 years. I now have a 5-year-old grandson and need to refurbish the goal for him too. I phoned today to find that you are still able to supply spare parts for this goal. I have broken the horizontal multi-surface support with my runaway mower and need a new net. This goal has been manhandled out of the way for grass cutting, it has withstood numerous penalties and collisions with players of all sizes over the years. The goalpost is still perfectly serviceable after all these years. Well done – It’s a Goal and a half! Goalpost reviews can also be found on our facebook page as well as our online supplier Soccertackle.com, and FOOTIE GOALS. 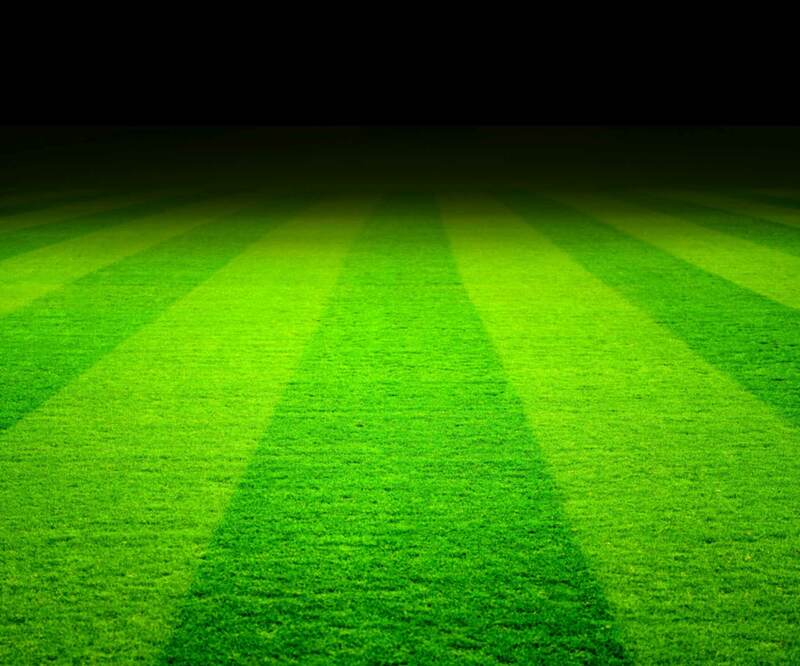 We do not use paid companies like Trustpilot for Goalpost reviews as these sites have enabled unscrupulous suppliers of poor quality products to download fictitious five-star Goalpost reviews that can mislead buyers.In the thirty years we have been supplying football goals we have never had a bad Goalpost review.